It’s almost time for the best fireworks display in the west! Monster Fireworks Display 2018 is just around the corner and again promises to be a fantastic family night of spectacular fireworks, delicious food stalls, fun festival rides and more. 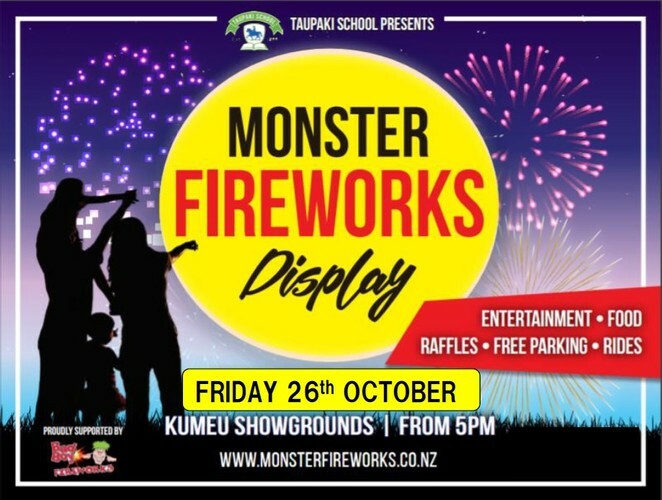 Presented by Taupaki School and Bad Boy Fireworks, this display is a wonderful community event for all ages. Monster Fireworks Display attracts up to 10,000 spectators to the Kumeu Showgrounds each year and the fireworks display by Bad Boy Fireworks is an impressive array of lights and colours. Parking is free and families can either enjoy a range of food from vendors or pack a basket of goodies and set up their own picnic – either way it’s a great, affordable night out. For more information on the Monster Fireworks Display & our “Push the Button” raffle, see our website and Facebook page.